Since 2000, James Pate has been depicting gang members in Ku Klux Klan robes, out of “frustration” with ongoing gun violence. Your History II, James Pate, 2007 Civil rights activists as passive observers of contemporary gun violence. Pope’s roster of young victims of gun violence in Chicago over a six-month period. One of the ideas that circulated around the recent Trayvon Martin murder trial is that African-Americans only care when white people kill black people. Critics have debunked that very notion as both a myth and an oversimplification, one that can obscure the way black communities do rally to respond to neighborhood violence, or how whites do sometimes resort to racist stereotypes in talking about criminality. Now another reaction to this idea of black-on-black violence can be found at KKK - Kin Killin’ Kin, a new exhibition at The DuSable Museum of African American History. But the more provocative aspect of Pate’s work may be the way he himself represents black people. 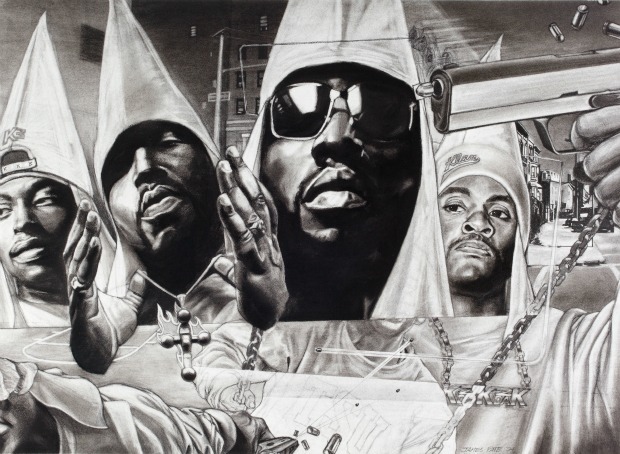 In large charcoal-on-canvas drawings, full of complex layers and details so exacting they almost appear to be 3-D renderings, Pate depicts gun-toting young black men as members of the Ku Klux Klan. Clad in sports jerseys, chains and white hoods, the boys shoot indiscriminately at one another, while bystanders are caught in the crossfire, including a young child on a swing. In the wake of Trayvon Martin’s killing, to show gang members clad in the robes of white racist vigilantes is a challenge, to say the least. But Pate said he has no choice. Pate’s images also juxtapose contemporary violence with action from other historical moments. In the foreground of Your History III, two young men drawn in bold relief shoot each other with semi-automatic pistols. On either side of the frame, drawn in fainter tones, there are rows of young men, seated at a restaurant counter, who appear to be witnesses to the shooting. Pate’s images cite other historical figures, from black Union soldiers to Adolf Hitler to Jam Master Jay of Run-DMC. There are even allusions to the crowds who came out to watch lynchings during the height of the Klan’s raids, depicted here as passive witnesses to violent acts. Pate said reaction to the work (which was shown previously in Ohio), ranges from recognition to anger, the latter especially from blacks who feel he’s airing dirty laundry. In response, Pate said that laundry was hung out long ago. Carol Adams, who heads the DuSable and brought the show to Chicago, agrees. Local audiences already seem to be paying attention. 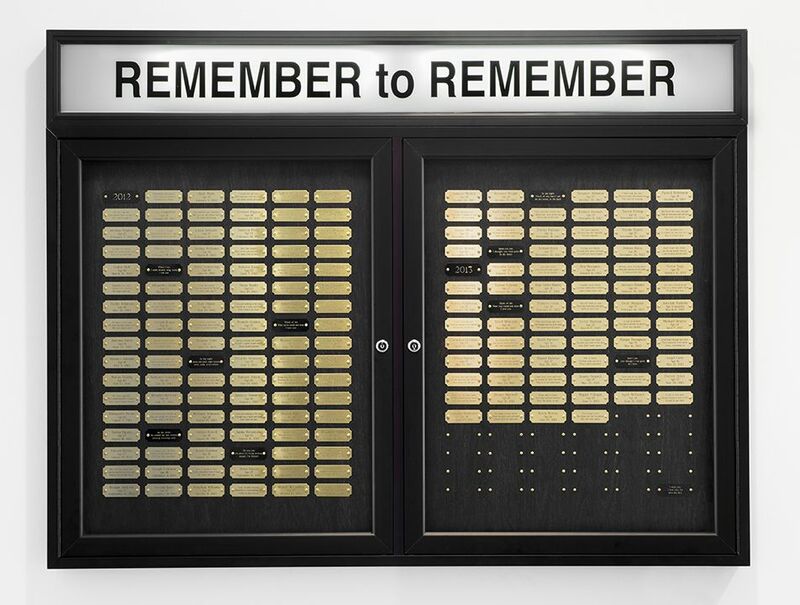 At the exhibition’s entrance, visitors are invited to write the names of deceased friends and family on small manila tags and attach them to stretches of chain-link fence installed for the show. Even before the show opened, museumgoers started filling out the tags - there are already more than a hundred on display. ‘KKK - Kin Killin’ Kin,’ The DuSable Museum of African American History, through Aug. 3. 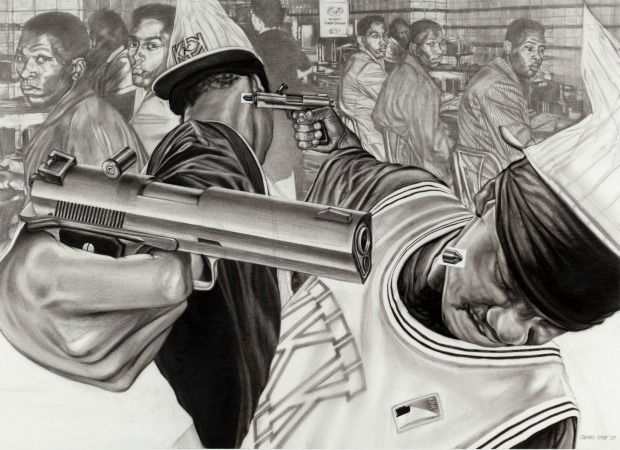 James Pate will give a gallery talk on Thursday, Aug. 1, from 6:30 - 9 p.m.
Cheryl Pope is another artist turning up the volume around the violence debate in her show Just Yell, which is at the moniquemeloche gallery through Aug. 3. The show’s name references the first cheerleaders, known as “yellers,” who in the late 19th century got up in front of crowds and started to call out cheers. Both the structure of Pope’s show (which is a collaboration with students from public schools across the city) and the works she’s created (which include a yearbook, a spirit stick, and a large wall-mounted varsity patch) are efforts to invoke the team mentality and powerful spirit of the yellers. But like Pate, Pope’s exhibition also contains a provocation: The colors scheme she’s used across the objects in her show are those of local gang The Latin Kings: gold, black and white. And she represents gang culture in other ways. In Just Yell ‘13: A Guidebook for Yellers, pictures of both victims and gunmen are displayed in tidy, yearbook-like rows. Despite their different styles, there are remarkable parallels between Pate and Pope. Both use inflammatory imagery not just to provoke viewers but to reveal their own emotional connections to the issue of violence (a perspective which partly results from working closely with young people, Pate as an artist-in-residence at public schools, Pope at the James R. Jordan Boys and Girls Club near the United Center). Both are committed to a continuing exploration of violence: Pate has moved into color images and Pope’s next project involves how people grieve for their communities. But by forcing together supposedly disparate groups - draping gang members in Klan robes or decorating a school spirit stick in gang colors - each artist has created a different space to discuss violence. Once you sort through that confusion of images, the space can come across as absence -- something painful and awful and empty. But it also contains potential, as a place from which it might be possible to do or say - or even yell - something new. 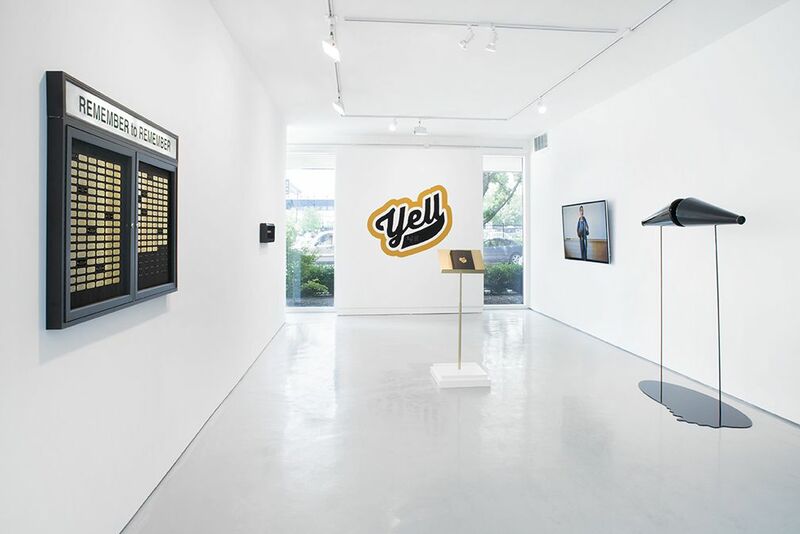 ‘Just Yell’ is at the moniquemeloche gallery through Aug. 3. On July 27, Pope has invited what she calls “game players” - those actually on the court rather than yelling from the sidelines - to the show, including aldermen, DCASE Commissioner Michelle Boone and Mayor Rahm Emanuel.